In a previous version, The Current incorrectly put Devin Johnson’s name as Devin Jackson in the feature photo’s cutline. American River College student and former mixed martial artist Devin Johnson told his story about the injury that left him paralyzed and effectively ended his very promising career as a pro fighter, during an ARC college hour Thursday. He also shared how he has persevered and turned this tragedy into a second start at life. Johnson was paralyzed due to a sparring incident, which dislocated his spine and caused extensive damage to his vertebrae. Doctors told him he had a three percent chance of being able to move anything from his neck down ever again. Now, a year later, Johnson is able to walk with a walker and has an impressive amount of mobility in his arms. 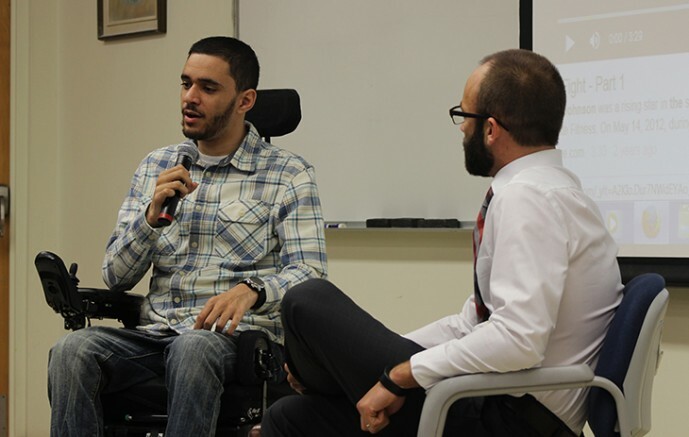 English professor Michael Angelone was the moderator and asked Jackson questions about his life pre- and post-injury in a question and answer style forum. Angelone is close friends with Sacramento based MMA fighter Urijah Faber, who is a part of Team Alpha Male, which Johnson was also a part of. Angelone shared a clip of the story KCRA ran about Johnson. Johnson said one of the toughest things about his condition is making sure he remains independent. “How do people treat you now versus how they treated you before?” asked Angelone. Despite his condition, Johnson doesn’t blame MMA and wouldn’t discourage others from joining it. “(You) put your all into something just to find out that the spotlight may never come,” Johnson said. Johnson said that MMA franchise does use its fighter’s wealth as a marketing scheme to draw in young and naive kids. He replied with a possible new surgical experiment to put wires in his legs, which would send messages to muscles and give him more mobility. Johnson has been at ARC for about two and half years and has taken an interest in accounting. He has hopes of becoming a certified public accountant. “Teaching accounting could be something for the future,” said Johnson. “I found [Johnson’s story] very interesting, glad I came,” said Louis Martinez, a spectator in the audience. 2 Comments on "ARC student and former MMA fighter shares story of paralyzing accident"
Why doesn’t he still empowering his legs. I have C3-C4 SCI after sparring in 2013, I was SYSTEMA Instructor. I exercise everyday and now I try to walk. You can see my YT channel: Olek Walczy POMOC DLA OLKA. I wish him more motivation and progress.